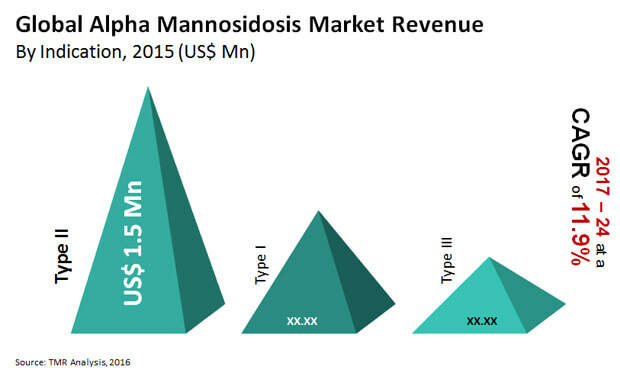 Owing to the limited patient pool of alpha mannosidosis across the globe and the vast costs involved in the development of orphan drugs, the competitive landscape of the global alpha mannosidosis market features only two notable players, namely Zymenex A/S and Cytomedix, Inc, observes Transparency Market Research in a recent report. The level of competition in the market is low to moderate and it is expected to remain the same in the near future as well. Transparency Market Research states that the market will exhibit a favorable 12% CAGR over the period between 2017 and 2024, rising to a valuation of US$21.8 mn by the end of 2024. On the basis of treatment methods, the report examines the market for enzyme replacement therapy (ERT) and bone marrow transplant (BMT). Of these, the segment of BMT is expected to dominate the global market and exhibit growth at a promising 9.2% CAGR over the forecast period. Owing to the exclusivity of the treatment method, its use is expected to remain equally popular in the near future as well. From a geographical perspective, the North America market for alpha mannosidosis is presently the leading contributor of revenue to the global market. The region is expected to continue to dominate, exhibiting a promising 12.3% CAGR over the period between 2017 and 2024. The overall encouragement to drug development through tax credits, a favorable exclusivity stature granted to orphan drugs, and a patient pool with high disposable incomes will continue to keep North America at the forefront of the alpha mannosidosis over the forecast period as well. The financial incentive in terms of market exclusivity of several years granted to companies producing drugs for orphan diseases such as alpha mannosidosis is one of the key factors encouraging companies to invest funds and resources in the research and development of such drugs. Lamazym, an enzyme replacement therapy for treatment of alpha mannosidosis, is designated as an orphan drug in the U.S. and the Europe. Over the course of the drugs’ exclusivity, regulatory authorities in these regions cannot approve generic versions of the drug for the same orphan disease. Moreover, in certain regions such as the U.S., the designation of orphan drug allows the drug manufacturer to claim tax credits of nearly 50% of the overall costs incurred in R&D during the clinical trial phase. This helps in lowering down the cost of clinical research for orphan drugs by nearly 24% as compared to the costs incurred without tax credits. These factors, coupled with the high cost of most orphan drugs, help companies to gain sustainable profits. The scenario could encourage more companies to invest in R&D activities aimed at the development of treatments for alpha mannosidosis, driving the market in the next few years. The cost of manufacturing orphan drugs continues to remain the most important factor restricting the development of the global alpha mannosidosis market. The limited patient pool for orphan diseases such as alpha mannosidosis restricts a company’s ability to recover funds invested in R&D activities, sometimes also despite obtaining tax credits. The profits are majorly based on the supply and demand of the drugs. The often low order of magnitude of the demand and supply volumes in the global market as well as the high investment involved in research and development result in high costs of orphan drugs. High costs do not only deter new companies from entering into the market but also restrict their acceptability mostly to developed countries where high disposable incomes allow patients to afford costly treatments.